The ‘Philadelphia Express’ is a Marine Transport Management controlled vessel. MTM is a Crowley Company. Can managers improve service and crew quality while re- ? ciency. That’s easier said than done. But Rodden says that ducing costs? 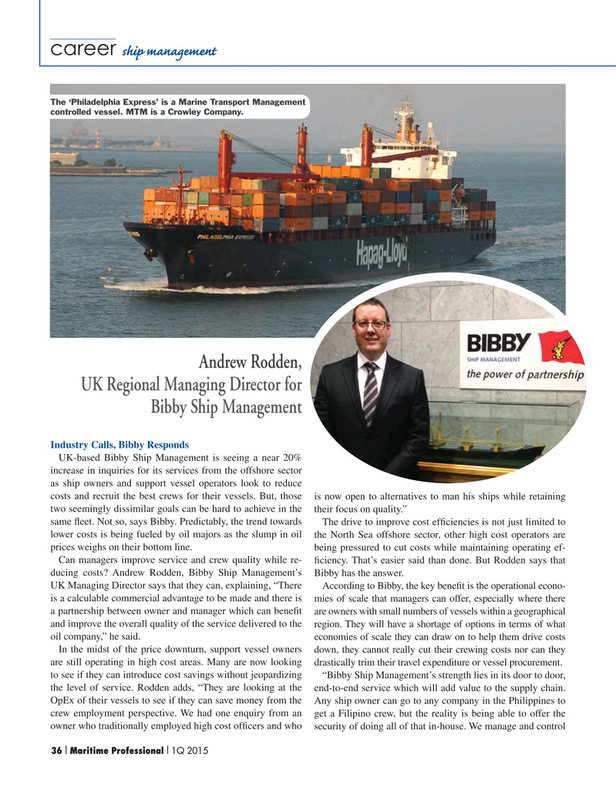 Andrew Rodden, Bibby Ship Management’s Bibby has the answer. In the midst of the price downturn, support vessel owners down, they cannot really cut their crewing costs nor can they are still operating in high cost areas. Many are now looking drastically trim their travel expenditure or vessel procurement. to see if they can introduce cost savings without jeopardizing “Bibby Ship Management’s strength lies in its door to door, the level of service. Rodden adds, “They are looking at the end-to-end service which will add value to the supply chain.